This list of naval ships of Ukraine includes major naval ships which are in service or were recently unlisted in the Ukrainian Navy. As of December 2007, the Navy had 27 combat ships and cutters. 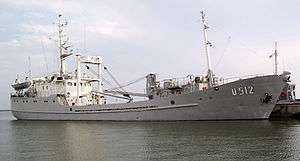 The current composition of the Ukrainian battle fleet consists entirely of former Soviet Black Sea Fleet ships. 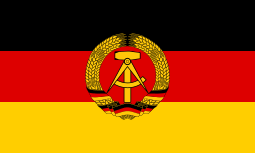 The shipbuilding industry was stalled after the fall of the Soviet Union. The revival of the industry took place after the Orange Revolution when, on 9 August 2005, the Cabinet of Ukraine provided funding for the national program "Corvette" that was initiated by Minister of Defense Anatoliy Hrytsenko. 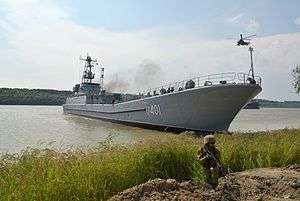 The first warship built in the independent Ukraine is expected to be completed in 2016. 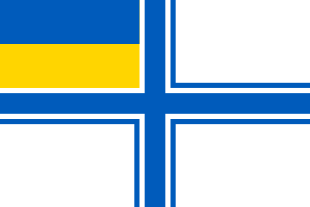 As of 24 March 2014, all of the major ships but one (the frigate Hetman Sahaydachniy) of the Ukrainian Navy were captured by the Russian Black Sea Fleet. Most of the ships listed as active were returned to Ukraine following the takeover of Crimea by Russia. In 2015 Ukraine received 5 Willard Marine patrol boats, the original order was placed in 2013. Grisha Corvette U206 Vinnytsia Soviet Union 1976 Vinnytsia was returned to the Ukrainian Navy from Crimea on 19 April 2014. Matka Missile boat U153 Pryluky Soviet Union 1980 Ship returned to the Ukrainian Navy from Crimea on 7 May 2014. Pryluky is currently redeployed in Odessa. Yaroslavets Tug boat Yaroslavets (U172) Soviet Union ? Yaroslavets (U173) Soviet Union ? ↑ "Willard Marine Wins Order To Supply Patrol Boats To International Navies". Homeland Security Today. ↑ "На военно-морской базе в Одессе осваивают американские катера для спецназа.". Information Resistance. 1 2 "All Ukrainian battle ships left Sevastopol Bay and Donuzlav Lake". 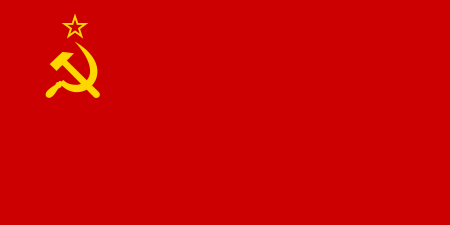 www.kyivpost.com. 2014-04-19. Retrieved 2014-05-29. ↑ "Russia Returns 5 More Navy Ships to Ukraine". en.ria.ru. 2014-05-08. Retrieved 2014-05-29. ↑ "Ukrainian Missile Cutter Pryluky Finishes First Sailing after Redeployment". navaltoday.com. 2014-05-08. Retrieved 2014-05-29. ↑ "Порошенко в Одессе переименовал "Кировоград" (ФОТО)". Retrieved 2016-07-03. 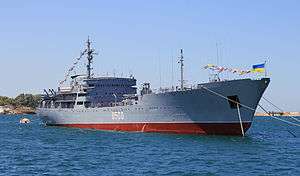 ↑ "Auxiliary ship Donbass returns from trials". moryaukrainy.livejournal.com. 2015-08-10. Retrieved 2016-02-22. ↑ "After leaving Crimea, the Ukrainian navy has partially renewed its fighting capability". mignews.com.ua. 2014-06-10. Retrieved 2016-02-22. Hardus, M. The harsh reality: is Ukraine ready to fight at sea (Суровая реальность: готова ли Украина воевать на море). "Apostrof". 29 January 2016.